Though strongly influenced by art and architecture, Beatrice’s true inspiration comes from her own photography, a hobby about which she is passionate. In translating the composition of a two-dimensional photograph into a pattern for a three-dimensional rug, Beatrice tries to capture the photo’s textures and shadows by exploring the sculptural possibilities offered by the weaving. Patterns with looped and raised piles such as “Branches,” “Sliver” and “Ginko” shimmer with chiaroscuro. “The texture brings strength to the space,” she observes. Beatrice’s interest in rugs evolved over the past decade, but only three years ago did she add rugs to her company’s slate of products. Already an award-winner for her architectural designs, she was pleasantly surprised when her very first rug, “Branches Orange,” won the Interior Design “Best of the Year” award for flooring. Though Beatrice says she has learned not to grow too attached to her work, she has a special fondness for her intricate “Reach” pattern, whose color flows from charcoal to light gray in a perfectly smooth and subtle gradient that takes 35 different dyes to achieve. Anyone who makes the investment in a handmade rug should know where the rug comes from and who made it, declares Beatrice. She wants people to understand that, for any rug to be “superior in quality, it has to be superior in soul.” It has to be sustainable environmentally and socially. 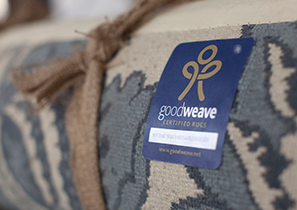 Reaching that goal is made easier for her because of her partnership with GoodWeave. To learn more about Indi-B, visit www.indib.com.